C.S. Friedman has always loved to read. At age 13 she wrote a vampire novel in her math notebook and began developing her science fiction worlds at age 14. Later she studied math, theater, and costume design at Brandeis University, Adelphi University and the University of Georgia. During that time she was involved with the Society for Creative Anachronism. She taught costume design until becoming a full time writer. Now she teaches creative writing part time. Learn more at C.S. Friedman’s website. Click here for more stories by C.S. Friedman. To have an enemy worthy of one's respect... that is a prize beyond measure. What is a lover's touch compared to such a thing? Love is but weakness shared, trials halved for being met in tandem. While a skilled enemy provides stimulation, challenge, and ultimately growth for all those who test their strength against his. I didn’t think that C.S. Friedman’s wonderful space epic In Conquest Born needed a sequel, but here it is, nonetheless. 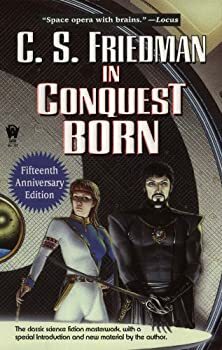 The Wilding can stand alone, but In Conquest Born is a better book, so I’d suggest reading it first. 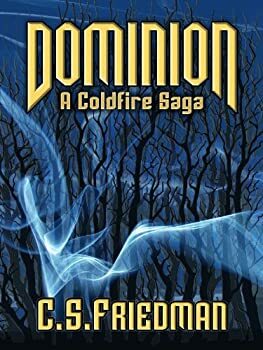 Coldfire — (1991-2012) Dominion is a prequel. Publisher: The Coldfire trilogy tells a story of discovery and battle against evil on a planet where a force of nature exists that is capable of reshaping the world in response to psychic stimulus. This terrifying force, much like magic, has the power to prey upon the human mind, drawing forth a person’s worst nightmare images or most treasured dreams and indiscriminately giving them life. This is the story of two men: one, a warrior priest ready to sacrifice anything and everything for the cause of humanity’s progress; the other, a sorcerer who has survived for countless centuries by a total submission to evil. They are absolute enemies who must unite to conquer an evil greater than anything their world has ever known. Refugees from Earth colonized the planet Erna some 1200 years ago. Excepting its extremely high seismic activity, Erna seemed a hospitable planet for mankind to call home. However, soon after our arrival a terrible threat was discovered. A natural force of energy called the fae animated the thoughts and emotions of all living things, so that our very nightmares could be brought to life. This almost destroyed us. Then, some humans figured out how to manipulate the fae to become sorcerers. A religion was created, too, based on the hope that faith would one day make mankind immune to fae manipulations. These two events kept the struggle against the fae at an uneasy stalemate for close to a millennium. But as human civilization has been developing, a dark force fed by the sorcerous uses of the fae has secretly grown in power to become a new and powerful threat. 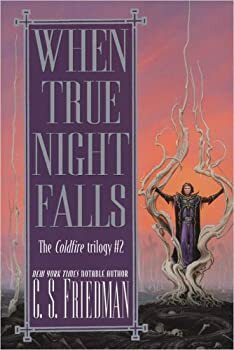 When True Night Falls is the second book in C.S. 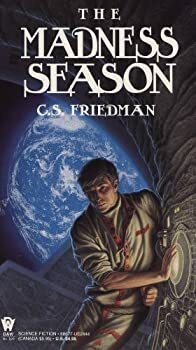 Friedman’s COLDFIRE trilogy. You’ll want to read the first book, Black Sun Rising, first. This review may spoil some of that first book’s plot. 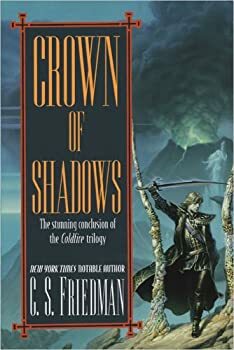 Crown of Shadows: But wait! There’s more! In the previous book, When True Night Falls, the unlikely allies Reverend Damien Vryce and undead vampire Gerald Tarrant battled their way across hostile foreign countries to combat the evil force that was threatening humanity. Just when they thought they were finished, they were essentially told: “But wait! There’s more!” Now they’re on their way back home where they will — they hope — finally really combat the actual final real ultimate source of evil ... which turns out to be Calesta the demon. Ever since I read a few novels by C.S. 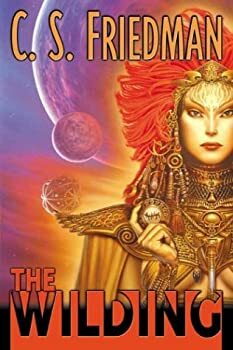 Friedman last year (In Conquest Born, The Wilding, The Madness Season and This Alien Shore) I’ve been practically desperate to begin her more famous COLDFIRE SAGA. Friedman’s stories are smart and creative and I can’t wait to see what else she has to offer. 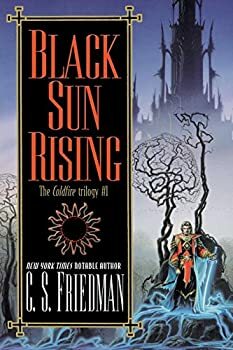 The only thing that’s so far kept me from picking up Black Sun Rising, the first COLDFIRE novel, is that I already have a huge stack (I mean hundreds) of audiobooks purchased and ready to read at Audible and on my bookshelves at home. Mostly I collect these when they’re on sale or when publishers send me review copies, so I hoard my precious Audible credits and spend them like a miser. Magister — (2007-2011) As the name implies, there will be three books. Publisher: At the end of her bestselling Coldfire Trilogy, C.S. 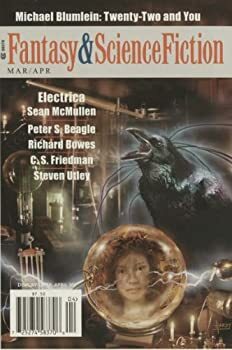 Friedman challenged readers to imagine what a world would be like if sorcery required the ultimate sacrifice — that of life itself. 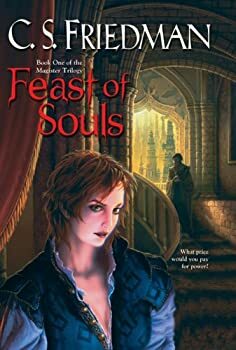 Now, in a groundbreaking new fantasy novel, Feast of Souls, she introduces us to a terrifying new world in which the cost of magic is just that — a world in which the fuel for sorcery is the very fire of the human spirit, and those who hunger for magical power must pay for it with their lives. In this epic tale of terrifying shadows and desperate hope, the greatest threat of all may not be that of ancient enemies returned, or ancient wars resumed, but of the darkness that lies within the hearts of men. There is only one way to do magic, and that is to expend life force to power it. Witches spend their own life force, and die young. Magisters have discovered how to spend the life force of another, and are nearly immortal, burning through consort after consort, while keeping the source of their magic a tightly guarded secret. No woman has ever become a Magister because they are unwilling to sacrifice others. No woman until Kamala, steeled by a life of child prostitution, secretly becomes a Magister. C.S. 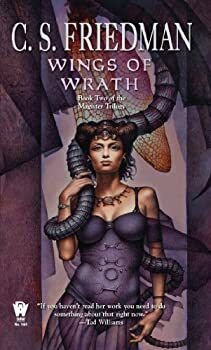 Friedman’s Wings of Wrath is the second book in her Magister Trilogy. It focuses on the story of a god-blessed race, the lyr, who have spent the last 1000 years preparing for the return of the Souleaters. At the end of the previous war with the Souleaters, the gods sent a magical wall, known as the Wrath, to bar them from ever being able to cross back into human lands again. Ever since, the lyr have been guarding the Wrath and watching for the Souleaters to reappear. But now the Wrath is weakening, and Souleaters have been seen again. Dreamwalker — (2014- ) Young adult. Publisher: Jessica Drake is a normal teenage girl, except for her strange dreams. She tells only her thirteen-year-old kid brother Tommy, a die-hard gamer, about them. He uses them to design game modules for his online buddies. Tommy is also the only one who knows about Jessica’s recent paternity test. The results show that Jessica’s DNA somehow doesn’t match either of her parents, even though the trail from womb to cradle is all accounted for, with no cradle-switches or adoption. Jessica is too shocked to ask her parents, so instead, she and Tommy dig around online — and find an entire community of people in the same predicament. Scientists are even starting to study some of them in secret, with disturbing results. Jessica and Tommy decide to meet two fellow teens in the DNA group, Devon and Rita, who warn Jessica that members of the group have been dying, in apparently unrelated ways. They are worried someone might come after them — especially after the arrival of a stranger, Miriam Seyer, who has a marked interest in Jessica’s dreams — but they feel they don’t have enough to go to the authorities with. Jessica finally confides in her mom, but that same night, before her parents can help, her house is set on fire. And her brother goes missing. Jessica must save her brother, no matter the cost. That pledge launches her into a new dimension, Terra Prime, where she learns she may be a dreamwalker. According to the legends, dreamwalkers are either doomed to insanity or marked for death in every human world. Are the legends true? Conspiracies, rebellion, magical tech, and alternate universes combine in this compelling adventure about a girl faced with saving two worlds — or risk losing her loved ones on both. I’m a big fan of C.S. 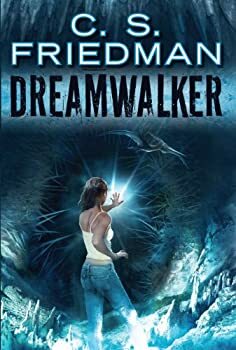 Friedman, so I was eager to get my hands on her latest novel, Dreamwalker. This is Friedman’s first Young Adult offering and while it doesn’t match the level of elegance, intelligence, inventiveness, and beauty of her adult novels, it’s better than most of what’s available on the YA shelves. I am quickly becoming a fan of C.S. Friedman. Audible Frontiers has recently produced all her novels in audio format, so I snatched them up and I’m happy I did. 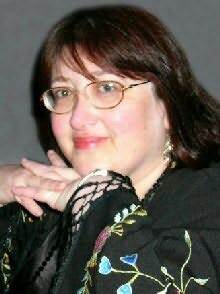 Her science fiction is original, imaginative, and super smart. 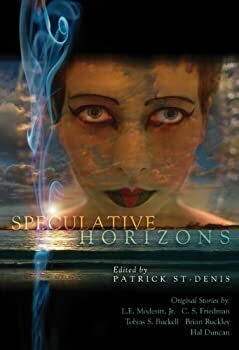 This Alien Shore is another outstanding science fiction novel by an author who I’ve come to respect immensely for her extraordinarily creative worlds, fascinating ideas, complex characters, and elegant prose. 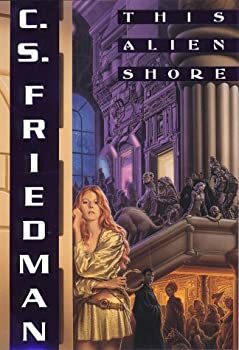 If there’s one flaw (from my perspective) with Friedman’s work, it’s a difficulty in actually liking many of her characters, but even if you find that it’s hard to sympathize with them, it’s also hard not to admire them, or at least to see them as superb creations.